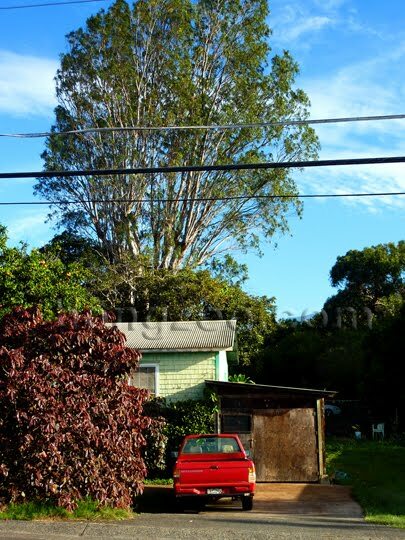 One of our Maui afternoons was spent in the quaint little cowboy town of Makawao. Although I am not one for shopping, it was fun to stroll down Baldwin Avenue and check out all the wonderful art galleries lining the street. As we headed back to our car, Dean noticed this adorable little place. He loved the highlights and shadows the late afternoon sun was casting across the landscape. as he snapped a quick photo. Although this is not one of my usual palm tree lined tropical beach scenes, I really enjoyed painting this piece. 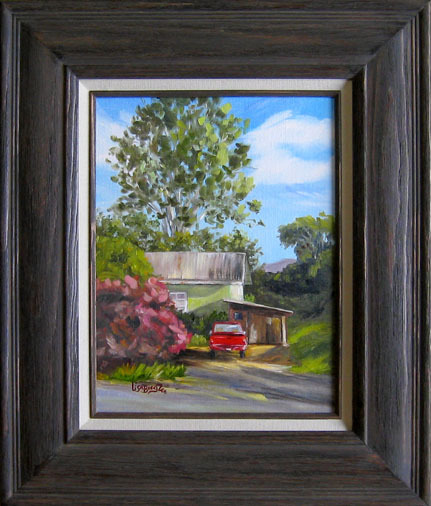 I feel that it captures the laid back, easy going Makawao lifestyle. To date, “Nakui No Ka ‘Oi” is one of my favorites. I hope you like it too! 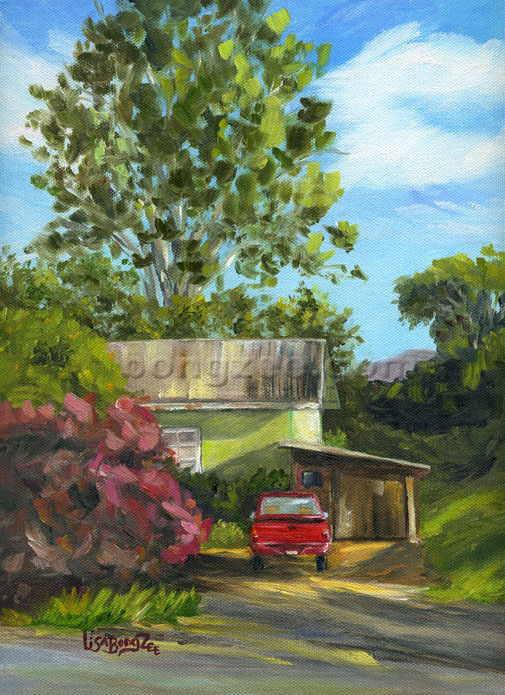 is an original oil painting done with brush. 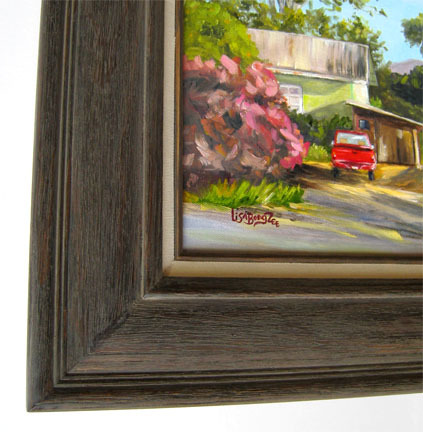 It comes framed in a rustic barnwood frame with liner. While visiting Maui, we spent a week in Upcountry Kula. It is such a beautiful rural setting. Rolling green hills along the side of Haleakala, filled with cows, horses, goats, sheep, and even deer. 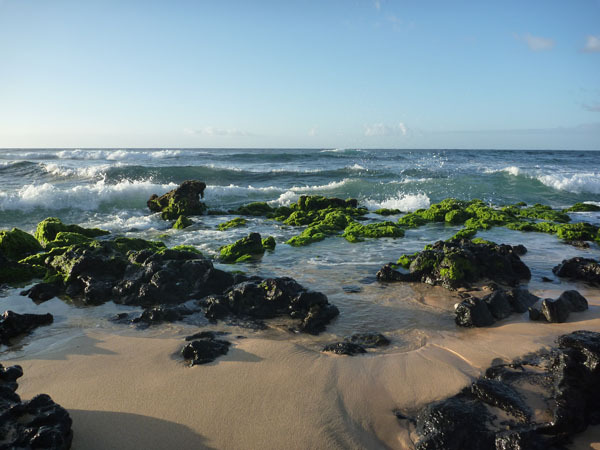 Quite a change of scene from the tourist-filled beaches of Kihei! 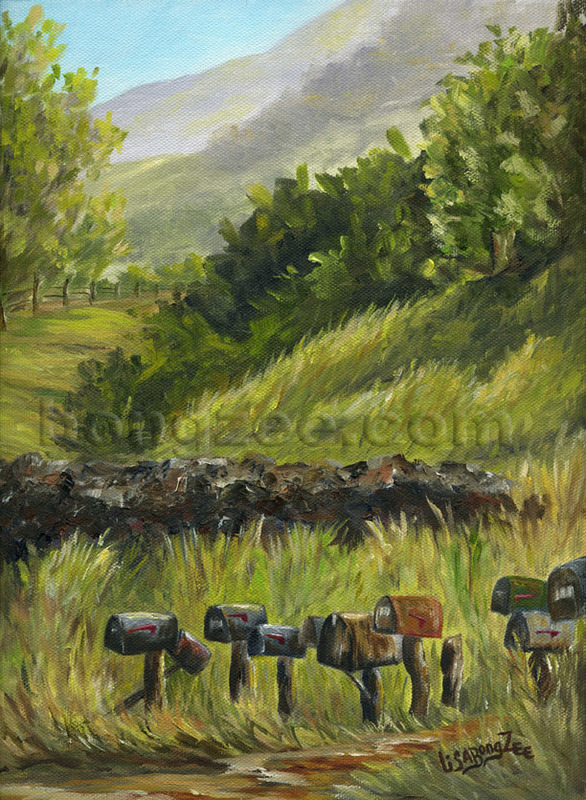 We often drove past this group of mailboxes along the Kula Hwy, directly across from the Sun Yat Sen Memorial Park. They always caught my eye and seemed to have so much character. 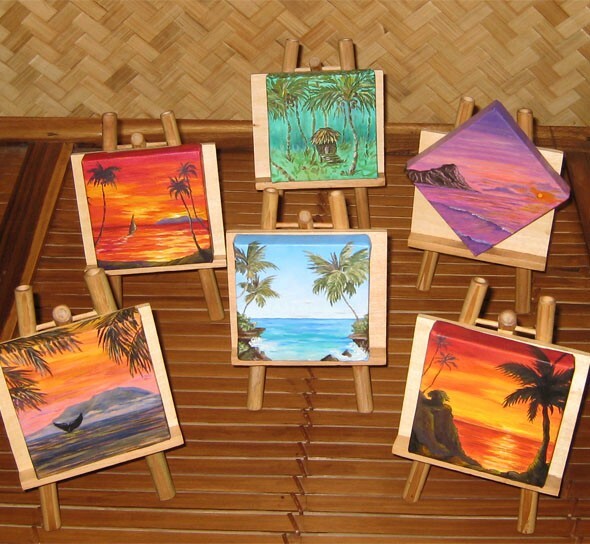 It is a week long plein air painting event that takes place in several different locations across Maui island. Dean and I really wanted to go and watch, as we know several of the artists that will be painting in this event. We were so excited, and the thought of getting to take Brighton along with us again made it extra special. He loves Maui. We have had to postpone our Utah snowboarding vacations for the past two years now, which has been a real bummer, so any little “spur-of-the-moment” trip – even if it is to just another Hawaiian Island, helps to make our non-snowboarding winters a little easier to take. I spent all day looking up condos and rental cars and couldn’t believe I was having no luck at all. EVERYTHING was booked, something must be wrong. How could there be no place? I finally ended up calling two different travel agents to see what they could come up with and they both said the same thing. Most places are booked solid until April! They explained that Maui is having a very good year, and that it is the height of whale watching season, so unless we wanted to spend around $600 a night (yeah right), everywhere was filled. What a major disappointment, but also a good lesson. Next time we will have to plan much earlier. Good luck to all the artists competing in the Invitational. I hope the whale watchers have a nice time on Maui. 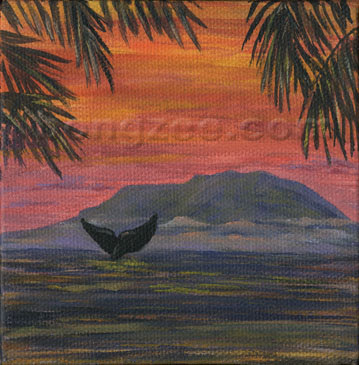 “Whale Of A Tail” is a mini 4x4 oil painting and comes with a cute bamboo easel. This morning, instead of going surfing, we decided to take our little pup, Brighton, down to the beach. Today is his Birthday and he loves nothing more than to stroll along the shore, digging his nose into the sand, dipping his toes in the water, and just getting as messy as can be. We arrived right before sunrise. Usually, we are out surfing at this time of morning, and it is always magical. Even if the surf is junk, just being out here watching the sky light up in beautiful pinks and purples is the best way to start the day! The entire beach glows bright pink for only a short moment. 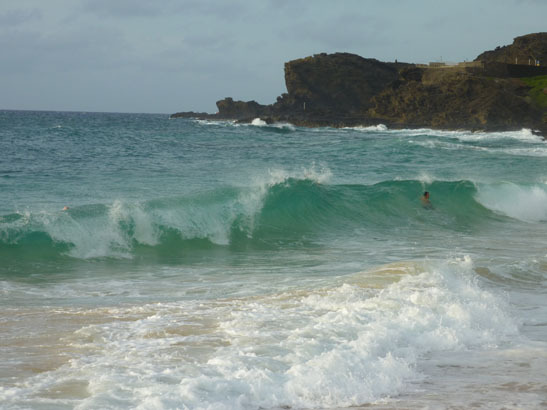 Sandy's may not be the prettiest beach on Oahu, but it is one of my favorites. 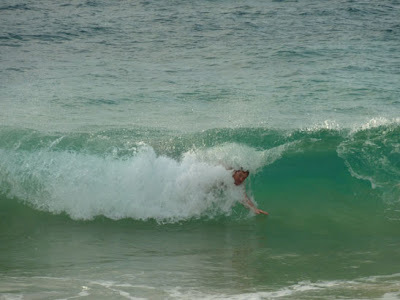 Watching the bodysurfers at Shorebreak (aka "Neckbreak"). Brighton helps me search for sea glass. Sea glass is as pretty to me as diamonds or pearls may be to other people. Browns and greens are fairly common, but Brighton made my day by finding a beautiful aqua blue piece! Way to go, little man! !